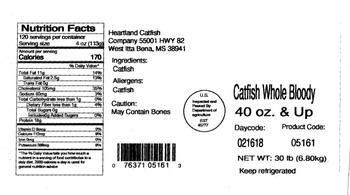 Heartland Catfish Company of Itta Bena, Miss., is recalling approximately 69,016 pounds of Siluriformes fish (catfish) products. The products may be contaminated with the chemical leucomalachite green, a dye used extensively in the aquaculture industry for the treatment of fungal and protozoal infections. 30-lb. packages of fresh “Catfish Whole Bloody 32 oz. & Up” with Daycode 021618 and Product Code 05411. 30-lb. packages of fresh “Catfish Whole Bloody 40 oz. & Up” with Daycode 021618 and Product Code 05161. 15-lb. packages of frozen “5 - 7 oz. Catfish Fillet Split” with Daycode 021628-1 and Product Code 3872686. 15-lb. packages of frozen “Catfish, Fillet 2-3 oz” with Daycode 021618-1 and Product Code 11010. 15-lb. packages of frozen “Catfish, Fillet 2-3 oz” with Daycode 021618-4 and Product Code 11010. 15-lb. packages of frozen “Catfish, Fillet 3-5 oz” with Daycode 021618-4 and Product Code 11020. 15-lb. packages of frozen “Catfish, Fillet 4-5 oz” with Daycode 021618-4 and Product Code 11490. 15-lb. packages of frozen “Catfish, Fillet 4.75-5.75 oz” with Daycode 021618-1 and Product Code 11180. 15-lb. packages of frozen “Catfish, Fillet 4.75-5.75 oz” with Daycode 021618-4 and Product Code 11180. 15-lb. packages of frozen “Catfish, Fillet 5-7 oz” with Daycode 021618-1 and Product Code 11030. 15-lb. packages of frozen “Catfish, Fillet 5-7 oz” with Daycode 021618-4 and Product Code 11030. 15-lb. packages of frozen “Catfish, Fillet 7-9 oz” with Daycode 021618-1 and Product Code 11040. 15-lb. packages of frozen “Catfish, Fillet 9-12 oz” with Daycode 021618-1 and Product Code 11050. 15-lb. packages of frozen “Catfish, Fillet 12 & UP” with Daycode 021618-1 and Product Code 11060. 15-lb. packages of frozen “Catfish, Fillet 4-5 oz Split” with Daycode 021618-1 and Product Code 11910. 15-lb. packages of frozen “Catfish, Fillet Irregular” with Daycode 021618-1 and Product Code 81000. 15-lb. packages of frozen “Catfish, Fillet Irregular” with Daycode 021618-4 and Product Code 81000. 15-lb. packages of frozen “Catfish Nugget” with Daycode 021618-1 and Product Code 31000. 15-lb. packages of frozen “Catfish Nugget” with Daycode 021618-4 and Product Code 31000. 15-lb. packages of frozen “Catfish Portions 3-5 oz” with Daycode 021618-1 and Product Code 21606. 15-lb. packages of frozen “Catfish Portion 3-5 oz” with Daycode 021618-4 and Product Code 21606. 15-lb. packages of frozen “Catfish Shank Fillet 3 - 5 oz.” with Daycode 021618-1 and Product Code 574636. 15-lb. packages of fresh “Catfish Shank Fillet 2-3 Dry Pack” with Daycode 021618 and Product Code 10010. 15-lb. packages of fresh “Catfish Shank Fillet 3-5 Dry Pack” with Daycode 021618 and Product Code 10020. 15-lb. packages of fresh “Catfish Shank Fillet 3.4-4.4 Dry Pack” with Daycode 021618 and Product Code 10480. 15-lb. packages of fresh “Catfish Shank Fillet 5-7 Dry Pack” with Daycode 021618 and Product Code 10030. 15-lb. packages of fresh “Catfish Shank Fillet 5&UP Dry Pack” with Daycode 021618 and Product Code 10240. 15-lb. packages of fresh “Catfish Shank Fillet 6-15 Dry Pack” with Daycode 021618 and Product Code 10400. 15-lb. packages of fresh “Catfish Shank Fillet 7-9 Dry Pack” with Daycode 021618 and Product Code 10040. 15-lb. packages of fresh “Catfish Shank Fillet 7-9 Dry Pack*” with Daycode 021618 and Product Code 10042. 15-lb. packages of fresh “Catfish Shank Fillet 9-12 Dry Pack” with Daycode 021618 and Product Code 10050. 15-lb. packages of fresh “Catfish Shank Fillet 10-12 Dry Pack” with Daycode 021618 and Product Code 10360. 15-lb. packages of fresh “Catfish Shank Fillet 12 UP Dry Pack” with Daycode 021618 and Product Code 10060. 15-lb. packages of fresh “Catfish Whole 5-8 Dry Pack” with Daycode 021618 and Product Code 00080. 15-lb. packages of fresh “Catfish Whole 7-16 Dry Pack” with Daycode 021618 and Product Code 00185. 15-lb. packages of fresh “Catfish Whole 7-13 Dry Pack” with Daycode 021618 and Product Code 00190. 15-lb. packages of fresh “Catfish Whole 8-16 Dry Pack” with Daycode 021618 and Product Code 00130. 15-lb. packages of fresh “Catfish Whole 8-16 Dry Pack*” with Daycode 021618 and Product Code 00132. 15-lb. packages of frozen “Catfish Whole 2-6 oz” with Daycode 021618-1 and Product Code 01070. 15-lb. packages of frozen “Catfish Whole 5-8 oz” with Daycode 021618-4 and Product Code 01080. 15-lb. packages of frozen “Catfish Whole 7-9 oz” with Daycode 021618-1 and Product Code 01040. 15-lb. packages of frozen “Catfish Whole 7-9 oz” with Daycode 021618-4 and Product Code 01040. 15-lb. packages of frozen “Catfish Whole 11-13 oz” with Daycode 021618-1 and Product Code 01100. 15-lb. packages of frozen “Catfish Whole 13-15 oz” with Daycode 021618-1 and Product Code 01110. 15-lb. packages of frozen “Catfish Whole 15-17 oz” with Daycode 021618-1 and Product Code 01120. 15-lb. packages of frozen “Texas Roadhouse Catfish Splits” with Daycode 021618-4 and Product Code 11920TX. 15-lb. packages of frozen “Texas Roadhouse Catfish Splits” with Daycode 021618-1 and Product Code 11920TX. The recalled products, bearing establishment number “EST. 45777” inside the USDA mark of inspection, were shipped to retail locations in Alabama, Arizona, Arkansas, Colorado, Illinois, Texas and Vermont. Customers who purchased the recalled should not consume them, but discard them or return them to the place of purchase. Consumers with questions about the recall may contact Danny Walker at (662) 254-7100.